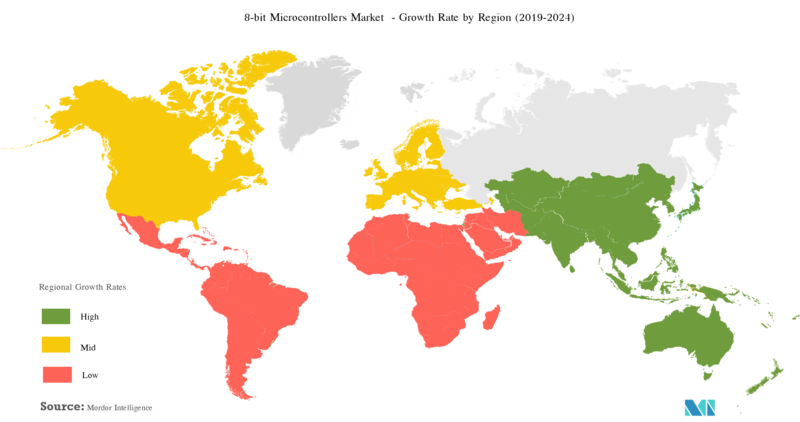 The market is segmented by End-user Industry (Aerospace & Defense, Consumer Electronics and Home Appliances, Automotive, Industrial, Healthcare and Data Processing and Communication), and Region. The global 8-bit microcontroller market was valued at USD 7.75 billion in 2018 and it is expected to reach a value of USD 10.13 billion by 2024 at a CAGR of 4.42%, during the forecast period (2019 - 2024). Microcontrollers are one of the most in-demand electronic components, with a wide range of applications in almost every industry vertical. Modern electronic devices are becoming increasingly dependent on these systems for computing power needed for operations. 8-bit microcontrollers are able to retain their market share, aided by strong demand for automotive and industrial applications. Also, advances in architecture, motor control, smart energy management, Ethernet and wireless connectivity requirements for home automation and control have led to a new range of applications for 8-bit MCUs. 8-bit low-pin-count (LPC) microcontrollers have taken advantage of process shrinks to increase their functionality and thus serve more applications than ever before at lower cost. However, intense competition from 16-bit and 32-bit microcontroller systems is one of the key challenges restraining the growth of the market. The market is segmented by End-user Industry (Aerospace & Defense, Consumer Electronics and Home Appliances, Automotive, Industrial, Healthcare and Data Processing and Communication). Consumer Electronics and Home Appliances register a significant market share due to 8-bit MCUs ultra-low power consumption and integrated high-performance analog features. Increasing adoption of Internet of Things (IoT) enabled devices is impacting the 8-bit microcontrollers market positively. The growing demand for connected technologies is playing a vital role in the adoption of IoT. Smart devices such as wearables, smoke detectors, thermostats, and glass breakage detection systems take excellent advantage of 8-bit MCUs' ultra-low power consumption and integrated high-performance analog features. Smart thermostats widely employ 8-bit microcontrollers as a cost-effective, low energy solution. The residential sector constitutes the major market for smart thermostat usage in smart homes which is estimated that by 2025, 10% of households across the globe will be Smart Homes, according to HCL. With the rising initiatives for smart homes across various countries, these devices are witnessing increased adoption, specifically, in the technologically rich, North American region. 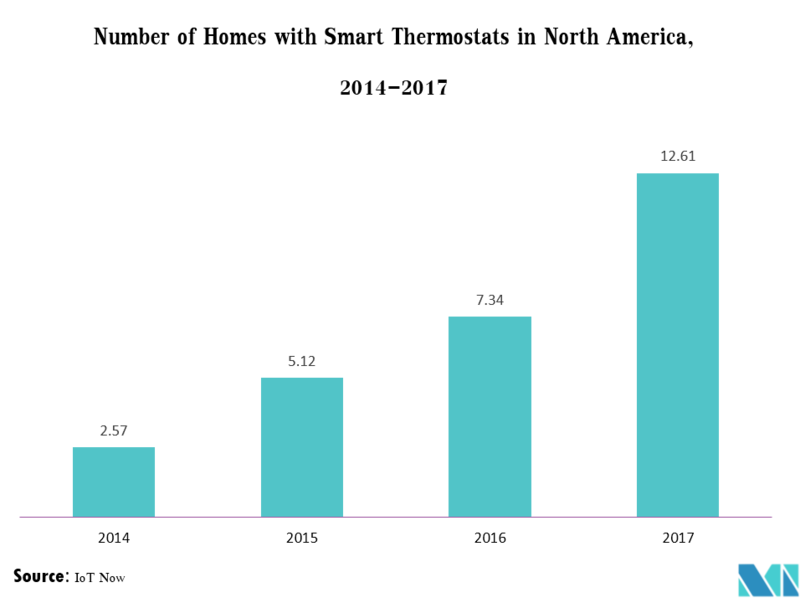 The North American market for 8-bit microcontrollers is driven by innovation in various segments, such as communication, consumer devices, and automotive over the forecast period. This region is one of the leading consumers of microcontrollers, owing to strong demand for high-end applications across major end-user applications. For instance, electric, hybrid and self-driven vehicles are one of the driving factors for 8-bit microcontrollers. The trend towards the increasing adoption of e-bicycles and moped's is anticipated to aid the market. According to IEA, in 2017, US cities partnered to mass-purchase Electric Vehicles for their public transportation, approximately over 110,000 electric vehicles. Smartphones, industrial automation and smart infrastructure devices such as meters, communications, electric vehicles are also the key drivers to the growth of microcontrollers in North America, especially the United States. 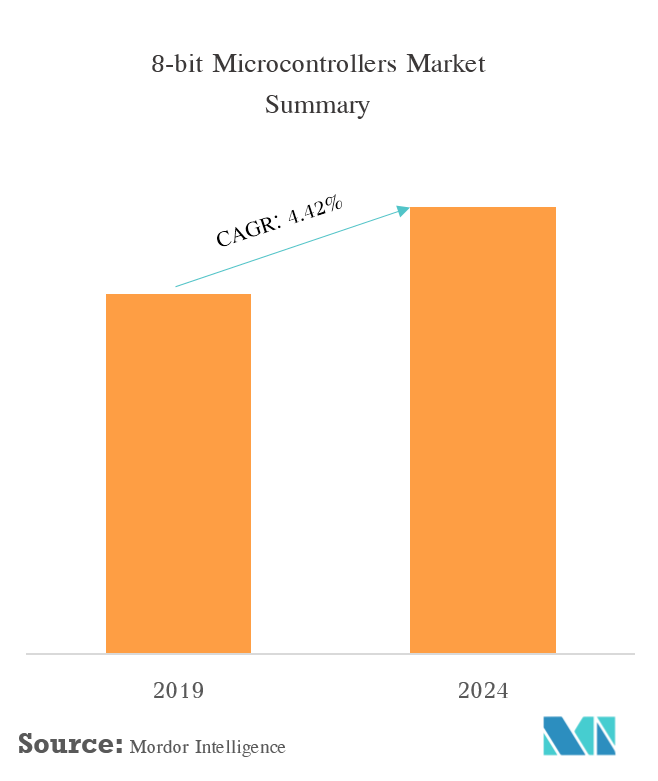 The 8-bit microcontrollers market is dominated by global players like Microchip and Renesas, which are expected to retain their present position over the forecast period. With global players being heavily focused on 16-bit and 32-bit microcontrollers, the investments in this space is slowing down. 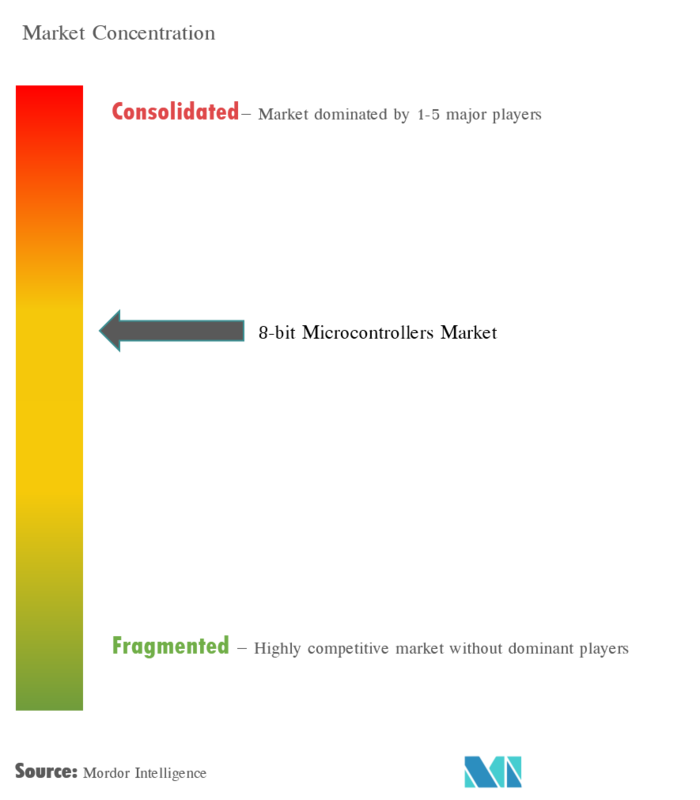 Therefore, the existing players enjoy low competition. 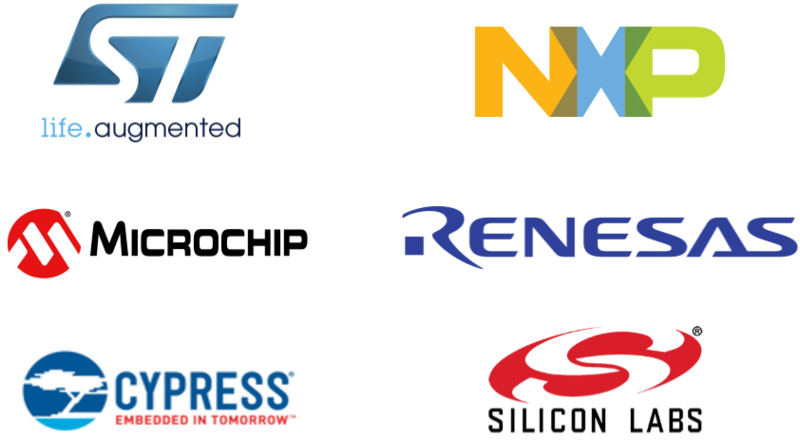 In 2019, Renesas acquire Integrated Device Technology (IDT) to provide a broader range of embedded solutions by combining IDT’s RF, memory interface, real-time interconnect, wireless power and smart sensors with its microcontrollers, system-on-chips and power management ICs. To enhance the capability and responsiveness of applications, Microchip Technology Inc. in 2018, expanded its tinyAVR, a family of 8-bit microcontrollers series to include two new devices with advanced analog features and the largest memory variant in the family. NXP Semiconductors NV acquired Quintic in 2015, to combine strength in ultra-low power microcontrollers and security with broad IoT application solutions offering, and global sales and distribution reach. 80% of our clients ask for some sort of customisation, be it specific countries / companies / segments.